And now! Time for another installment of a serial all about the totally real adventures of monself and the fabmazing Amalia Dillin! Woooo! Zombiesss! Many things have happened in this tale but, really, all you need to know is over here. I was electrocuted and this was very dramatic. Also, I seem to have successfully forced everyone into calling me Admiral. Yes I did. So! Anyway! More of le tale! Having great amounts of electricity pulsing straight through you not once, but twice, does wonders for clarity. Blinking, and rubbing my chest, I wave my zombies away. They see the twitch in my fingers, or maybe they can just smell ozone on me and are worried about the ozone unicorns Tyler told them about last week. Either way, within seconds they are swarming not around me but Adam who enlists Baldur to generously hands out hot dogs with him. I watch Baldur pat a few tentatively before I set about getting upright. I always need space after incidents like these. Granted, normally they involve bites and antidotes and near undead experiences but, besides still fizzling at bit at the edges, I feel pretty much the same. Standing, and waving away a hand from Amalia, I make a mental note to add some kind of headache cure to my growing list of things to find and ingest. "So," I say to Thor as his face and the world wobbles. I shift to watch suspicious shadows in the corner converge. Amalia and Thor seem uneasy, like they're hiding something, but it's Adler and Bragi that concern me. "I figure this makes us up to Level 4 on the friendship scale now, huh? Awesome." I'm not sure it really does, level 4 would require me to trust him with most of the Zombies Anonymous top secret files including the one about the time we accidentally drew a moustache on a sleeping Thunder God when Amalia invited us round for a cooked meal and he unwittingly was unconscious when we arrived, but every time I pause for breath Adler and Bragi stop whispering and their gazes veer dangerously close to mine. They're up to something, I know it, but if I point that out I'm thinking this will negate the offer of a bed for us. "Of course," I continue, wringing my hands as I watch Adler and her friend pick up their dialogue again, "this will require some signatures from you because there was that one time with the werewolf from Kuala Lumpur who was all fun and games until we-"
"Mia, " Amalia's hands are cold as they settle on my arm, "are you okay? You still look a little green maybe you should just let us-"
"Cotton!" I burst out with, slipping from her grasp. I'm not so inclined to have my zombies or Thor in the room when I confront Adler. 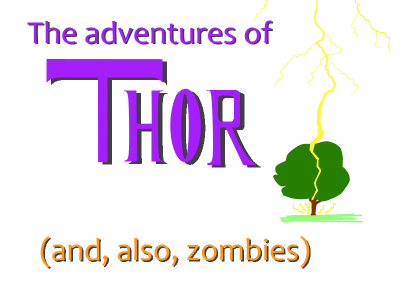 The way my calf twitches when I step back reminds me of what happens during intense zombie-Thor moments. "Uhm, the rooms. What kind of sheets are there?" Amalia and Thor share a look before she says, "I'm not really... this is the Asgardian embassy so... I mean we could check for you if it's a problem?" "YES! "Amalia and Thor share another look. It's a look I see a lot, mostly in the street before the people in white arrive. I correct with a, "I mean, sure, uh, whatever, that would be good. If you could lead the zombies they'll check for you. They have very specific requirements so, you know..."
It takes a while to herd everyone I want to leave out of the room. Several times I have to catch Tyler before he leads Adler away. In the end I come up with something lame about needing girl talk with her. She raises an eyebrow, gaze running up and down me, before nodding. I think we both know in my current state I am not the authority on anything besides how to gently sizzle and pull off this season's must have "just electrocuted" look. It is only when we are alone that a wave of uncertainty hits me. It is only when she smiles, revealing those already bloodied fangs, that I consider a one on one chat with a vampire to be not such a good idea. I turn to politely excuse myself, perhaps gather courage in the corridor, but find the door sealed shut. "It's funny," Adler says as I swivel to lean my back against the door. "I'm not overly fond of getting tinny specks of glitter stuck in my teeth..." She smiles, walking forward, and for the second time today I am absolutely certain I am about to die. And I don't even get to know why she was talking to Bragi. "I guess for you I could make an exception." Ahhhhhh. DRAMA. You'll have to wait until next week to find out just what is happening. Ahhhhh.